Warehouses are full of obvious hazards as well as ones that seem to be lurking in the shadows. The more major hazards are usually identifiable and well-known while the lesser known dangers are not immediately apparent without proper education and markings. If you don’t know what to look for, these smaller hazards can prove fatal. Below are just a few of the most common warehouse hazards you and your personnel should be aware of. Despite educating your personnel on how to properly lift heavy objects, injuries are still very common. Because each worker is different, you can’t always predict how carrying or lifting an item will cause bodily strain. Pressure and prolonged exposure to heavy labor can result in injuries no matter the size and shape of the person doing the lifting. That’s why back, leg, and foot injuries are commonplace in a warehouse setting. Educating workers on personal awareness should be your first, and perhaps your best, line of defense against these types of injuries. Personnel should also have the freedom to alert a supervisor if they feel they are at risk. 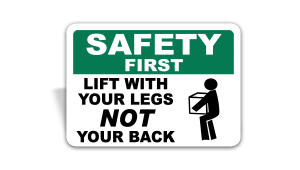 For continued injury prevention, all warehouse employees should be trained in proper lifting techniques. These types of hazards can be very dangerous because they are not always easy to spot. For example, employees entering a building while it’s raining outside may cause stairs or floors to be slippery. Even in well-lit areas, it’s often different to spot liquids on the floor. In other situations, sawdust can be just as hazardous. It can create a slick surface, which may result in a dangerous fall. Falls, despite misconceptions, do not have to be from a high position to be dangerous. Falling down stairs or falling from a small ladder can be just as serious as falling from greater heights. Outside of general awareness, the best way to prevent slips is by diligently cleaning. 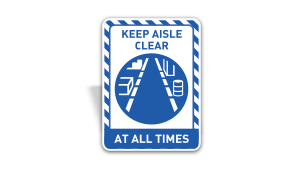 Moreover, caution signs should be present to remind employees to keep a clean work station, path, and floor. To prevent falls, high locations should feature guard rails, while steps and ledges should utilize anti-slip tape. Heavy machinery, even when operated by seasoned machinists, is a large concern when it comes to workplace safety. With so many moving components, these types of machines can be extremely dangerous if safety precautions are not implemented. 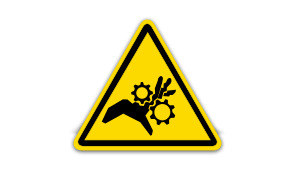 Employees should be educated on what to look for when operating heavy machinery. They should also know what specific warning labels mean to ensure their safety as well as the safety of other employees. For similar reasons, applicable Machine Safety Labels should be placed in strategic and prominent locations. While it should be understood, it begs repeating that regularly maintaining machines is crucial to protecting workers. Just between these three hazards, it’s pretty evident that warehouses are filled with dangers. However, using the proper precautions and undergoing the necessary training can help ensure personnel have a safe experience at all times.